When you write memoir, sooner or later you come upon the issue of, “Is this my story to tell?” – “What about the other people in the story?” As with any dilemma, there is no easy answer. It is, arguably, easier to write about dead people, but there you often run into the issue of whether you can verify those stories of the past, especially those you did not experience yourself. When my aunt and uncle visited last fall, I brought out my sewing machine, which used to belong to my great-grandfather, namely my uncle’s (and my mom’s) paternal grandfather. He gave it to my mom when she moved to Germany, and she in turn gave it to me when I became interested in sewing in my teens. Even though it is a basic Singer machine that only goes back and forth, no fancy zigzag or anything like that, for many years I made almost all my own clothes with it, including a leather coat (it is a heavy duty machine) and my wedding dress. When I moved back to the States, I took it with me, unwrapped the original U.S. motor my dad had carefully packaged in 1964 newspaper, took off the German motor, attached the old American one and voila, the machine worked again on U.S. current. Alas, these days I mainly shorten pants with it or sew the odd costume for my kids. But every time I take it out, I’m proud that I’m still using something that’s older than I am, and that those who came before me have sat at, hunched over, rattling away. 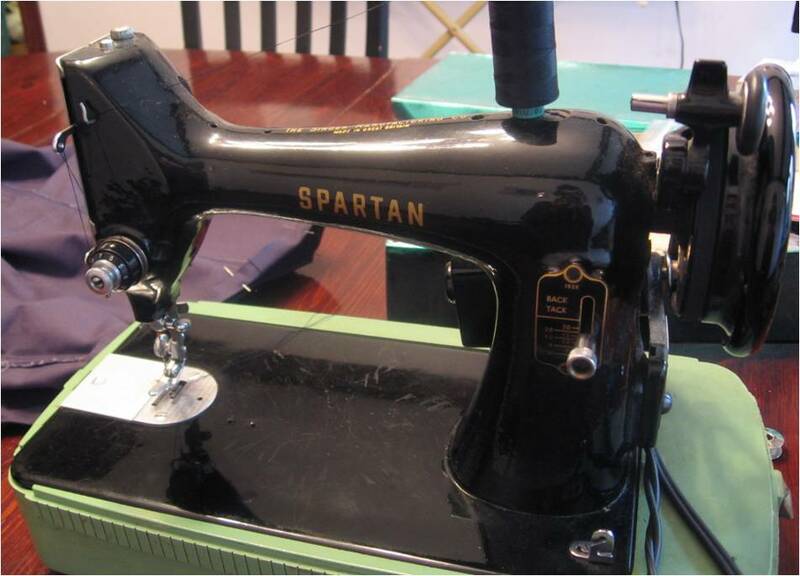 My mom’s story goes that her grandfather bought that sewing machine in the late 1950s to sew underwear for his incontinent wife. I cherish that story because I always found it rather remarkable that such a manly man as my great-grandfather had sat down to sew underwear. It seemed like such a loving gesture. Had my uncle heard that same story? He hadn’t. Instead, he told me other stories about my great-grandparents; that, for instance, they didn’t speak to each other for a few years because of some falling out. Still lived together, ate together, slept together, but didn’t talk to each other. Remarkable, eh? Thanks for sharing this very enlightening post. There are so many versions of the truth and since memoir involves stories of real people, it can be challenging to find and own what story is ours to tell. Linda Wisniewski has addressed a similar issue today over at my blog: http://krpooler.com- telling our stories despite the reactions of others. I will share your post on Twitter, Facebook and Google+ Great job. Your story illustrates your point perfectly. Kathleen – thanks for stopping by, commenting and sharing this post. I loved visiting your blog! Excellent point made in this post, Annette. Besides that, I enjoyed the stories of your family. Yesterday, my book club discussed "The Immortal Life of Henrietta Lacks" and one woman focused totally on the science part of the story of the HeLa cells, but for me, it was more about the people and what the science end of the story did to and for them. More of us focused on the people part of the book. Nancy – I think you put your finger on it: It's the people we connect with, which is why memoir is such a powerful way to tell history. Great post and perfect ending. "I think you own that story." Could become a family saying. Great to see your words again, Annette. It's been too long. I too will share this post online. ShirleyHS – hi! Thanks for reconnecting and for sharing my post. We memoir writers have to stick together!